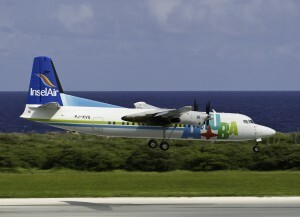 WILLEMSTAD - On Saturday, April 12, 2014, around 7pm a Fokker 50 aircraft with registration PJKVI of InselAir made a precautionary landing at the airport of Curacao. The reason for this was a signal in the cockpit that indicated a hydraulic problem in the aircraft. The crew has executed the necessary procedures and precautions that apply in such a situation which also included involving the authorities. The aircraft landed without any problems and was moved to the hangar where the cause of the warning signal is further examined. The safety of the passengers has never been in danger and all passengers have disembarked the aircraft without any problems. A spare aircraft has been put into operation to execute the scheduled flights of the Fokker 50.